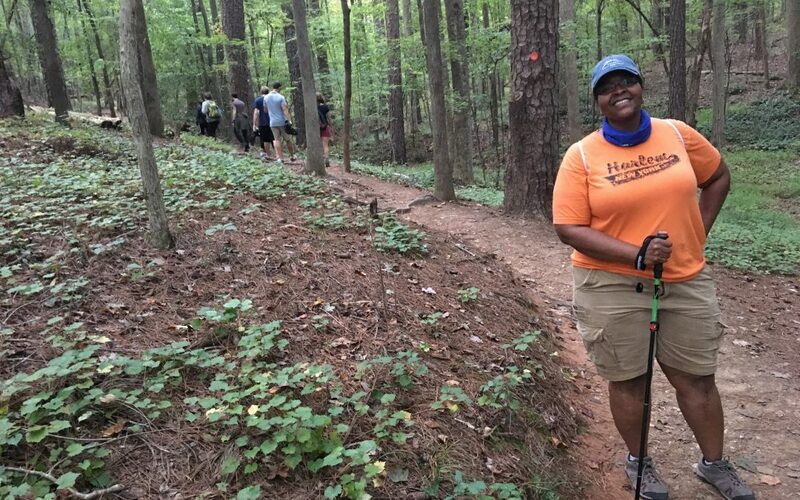 So who’s been coming out on our beginner-oriented Hike NC! hikes? Folks you can probably identify with. 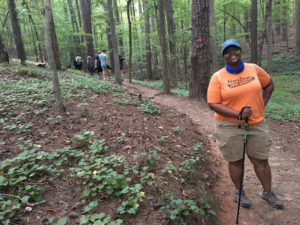 This fall, Blue Cross and Blue Shield of North Carolina partnered with North Carolina State Parks, North Carolina Recreation and Park Association, Friends of State Parks, Great Outdoor Provision Co. and GetGoingNC to launch a statewide hiking program target toward people with little or no experience on the trail. 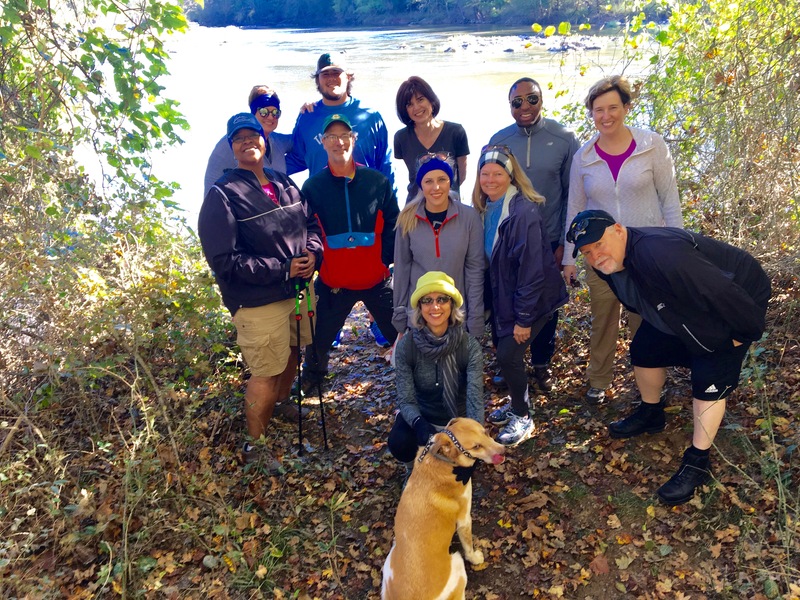 We’ve scheduled more than 60 hikes, most geared toward first-timers, into early December. By and large, the hikes range from 2 to 4 miles in length and do what they can to insure a great introduction to the trail. So who’s shown up during our first four weeks of hiking? Kimberly Dixon, for one. Kimberly was born bowlegged, a condition that generated a case of arthritis when she was 12. It wasn’t long before simply walking became a challenge. When she was 32, she inquired about knee replacements. Too young, she was told: come back in 25 years. Advances in knee replacement technology meant she could get new knees sooner. She had both replaced last year, in March and December, and began walking around the block soon after, with the goal of eventually hiking on natural surface trail. This fall, that goal was achieved. There’s Steve Anderson. Steve was once a competitive runner — a very competitive runner. “I ran 20 marathons over 26 years of running,” says Steve, who ran more than 150 races — from 5Ks to trail runs — overall. He logged between 30 and 60 miles a week, depending on his race schedule, a schedule that would, eventually, take a toll on his knees. About 8 years ago, they cried, “no mas,” and Steve hung up his trainers. Our Hike NC! 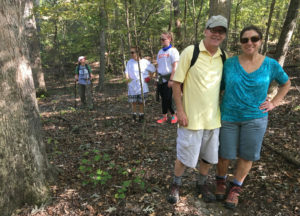 hike Saturday morning at White Pines Nature Preserve south of Pittsboro reflected a mix of reasons for hitting the trail. Pam came with her dog, Rueben, because they both like being in the woods and were looking for a change of pace. “We usually go to Hemlock Bluffs in Cary,” Pam said. 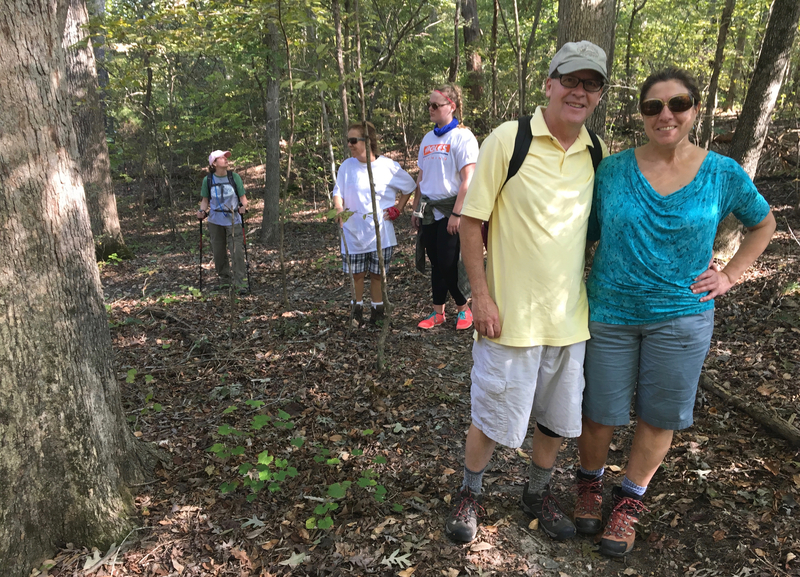 There was a family from the Southern Pines area, most of whom had never hiked, who were looking for something they could do together. Dave, who had recently taken up backpacking, was there because he’d never heard of White Pines (none of the baker’s dozen on the hike had) and was intrigued by the fact that, because of a geographic anomaly, it was sometimes 10 degrees cooler here than in nearby Pittsboro. Amy was trying to jump-start a hiking career that was waylaid by work last year, and Jarratt had just moved back to the area after 10 years and was relearning the outdoor scene. And, no surprise, Kimberly Dixon and her new knees were there as well. There was a range of ability levels, but the group stuck together. 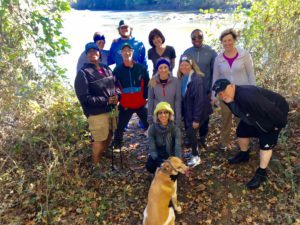 The social element of hiking proved as enticing as the gorgeous fall day itself, even among folks who’d never met. The true test, of course, came at the end: Did you like the hike enough to do it again? “I’m signed up for the hike tomorrow, at Johnston Mill,” Kimberly said as the hikers milled about afterward.